Civil War’s debut album The Killer Angels from 2013 is one of the biggest musical surprises in my entire life. See, there is a Swedish power metal band called Sabaton. Now, I’m sure the guys in Sabaton are really nice blokes and everything, but the thing is, I can’t stand their music. I mean, I really think it’s disgusting. Four guys out six jumped the Sabaton ship and joined forces with a lead singer named Nils Patrik Johansson, a guy that comes from a completely different musical background. Nils Patrik had sung with bands such as Lion’s Share and Astral Doors – more heavy metal acts – before and has a vocal style that mixes Ronnie James Dio, Eric Adams (Manowar) and Tony Martin (ex – Black Sabbath) and the whole thing looked like a match made in… well, anywhere but heaven, really. Needless to say, Civil War didn’t arouse me one bit at first, I figured, why on Earth would I give a crap about 4/6 out of Sabaton and their new band? I mean, I only knew Nils Patrik Johansson by name and hade never even heard him sing, at least as far as I knew. So I didn’t. Give a crap, that is. Well, life takes funny turns sometimes, me being a subscriber to Sweden’s – well, Scandinavia’s to be exact – biggest and greatest rock mag, Sweden Rock Magazine, and it so happened that Civil War decided to give their debut album away for free to all SRM’s subscribers, the whole CD with cover and all. Now, only a moron would just throw a gift like that away without at least giving it a chance. I may be many things, but a moron, I am not. I hope. So, what the heck, I put the CD in my player and 50 minutes later I had surrendered. Man, this was good. First spin was good. No great – good. But good enough for a review, so in to my iPhone it went and it took me just another 50 minutes to change my mind – this wasn’t good, this was great. Fact is, that album hasn’t left my dear phone since that day, until now when I replaced it with the new one. So, from low expectations to huge ones. Sky high ones. I also hade the pleasure to watch the band live on two occasions, once at Väsby Rock Festival in 2013 and once as openers for Queensrÿche later the same year and they were great. Johansson is really an awesome singer – and then some! “War Of The World” bursts open and it sounds a lot like I did expect it to sound, having heard their debut album. It’s heavy, fast, melodic and catchy with an undertone of power metal. It’s a really good tune that sets the standard for the rest of the album. First single “Bay Of Pigs” is brilliant, a catchy metal tune with an Accept-like break in the middle. “Braveheart” opens with a Queen-like intro that breaks into a real metal stomper and very much a Civil War song that could have been off their debut. “The Mad Piper” is without a doubt one of this album’s finest moments. It sports both bagpipes and military cadence drums. It also has a celtic feel all over it, the kind that you can hear on a Black Star Riders album, or even on a Thin Lizzy one. “USS Monitor” takes a heavier and faster direction, more standard metal. Good, but a bit forgettable, I’m afraid. Like a balladeer, Johansson’s throat brings life to the stunning ballad “Tears Of The North”, a viking song, but more a sensitive one as it takes place at a viking funeral. A band like Manowar would have sold their mothers for a tune like this. “Admiral Over The Oceans” has this fast, Iron Maiden-type of a galloping rhythm and the melodies are all über-catchy, both verses and choruses. Another one of this album’s most brilliant moments. A World War 2 theme song in “Back To Iwo Jama” has a marching rhythm and the big, chanting “whoa whoa whoa whoa” backing vocals makes me think of Accept. “Schindler’s Ark” is one of this album’s most dark moments, a heavy and grand ballad where Johansson takes a more Coverdale-ish approach vocally and it suits him really well. The album closes with the title track, a dramatic metal track that promises a bit more than it actually delivers. It’s a decent song, but it kind of passes me by unnoticed. Two bonus tracks are also included and I still don’t get the whole bonus track thing. Put your songs on the album or don’t, nobody is impressed by the whole bonus track thing anymore. Bonus for what, I wonder? Well, “Knights Of Dalecarlia” has a great melody, a brilliant rhythm, but the big chorus falls flat which makes it a bit of an anti-climax. “Colurs Of My Shield” is great, however. This is an U.D.O. type of song, catchy metal in a middle pace speed that brings on a bit of a Manowar feel on the side. Style-wise, it’s pretty clear that if you liked their debut, you will probably like this one as well as no major changes has happened to this band. As a whole, this album might be just a tiny bit more heavy than its predecessor, but Civil War pretty much has their brand of metal nailed. Which might actually turn into a ball and chain for them in the future, because how far can you take a concept like this without repeating yourself or being just a copy of yourself? Because their name, Civil War, might turn into a noose around their necks. How can you move forward with a name like Civil War, if you somewhere in time want to try out a different direction? Also, by making the war theme their own, what are they gonna do when that topic has been emptied, when there are no more wars to write about and how long will people want to listen to songs about it, especially since Sabaton does the same thing? Oh well, these are questions for another day, really. 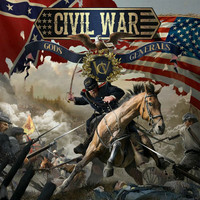 For now, Civil War has released a second portion of really good songs that will hopefully take them far and maybe give Sabaton a run for their money. Civil War has impressed me for a second time and proved that their debut wasn’t just a lucky shot. Good job, boys. Nice coincidence. Just yesterday my son mentioned to me that he had come across this group and album while exploring options to use up an iTunes gift certificate. He bought it based on listening to samples and ended up really liking it. I just saved it to a Spotify folder last night based on his recommendation but haven’t listened yet. Now, today I find your positive (and always trustworthy) review. I guess either the Gods or the Generals (or both) are conspiring to send me the message that I should check this one out! Trustworthy… Wow! Big thanks and many of them. You know, this band don’t really play my kind of metal, but it doesn’t matter, they’re a damn good band. Do check out the debut as well.